Whether it's a brochure, a postcard, a billboard, a magazine ad, a silt fence (yup! not a typo! ), or a complete corporate identity program, we can make you look good in print. Here's a small selection of recent print projects. Noland Suttles Salon is known as "the Hair Color Salon". 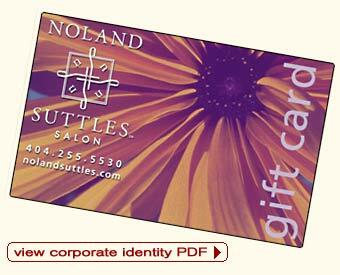 As a part of their new salon, Noland Suttles engaged Relevant Arts to do a makeover of their corporate identity materials, including a monthly newsletter, stationery system, salon menu, postcards, and other small marketing pieces. The goal was to market personal service in a fun, but classy style. It's been a delightful project and a welcome change of pace for us! 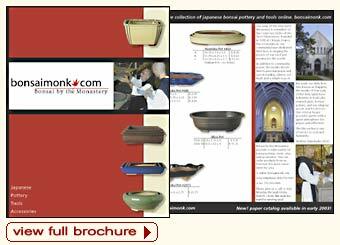 In order to promote their new shipment of pottery, the Monastery engaged Relevant Arts to design a marketing brochure to mail to wholesale and retail customers. 4 Color Ad for "In the Pipeline"
As a part of an ad campaign for Halpern's newest shopping center, Relevant Arts designed an advertising layout for Griffin Crossroads to be featured alongside of a full page article. 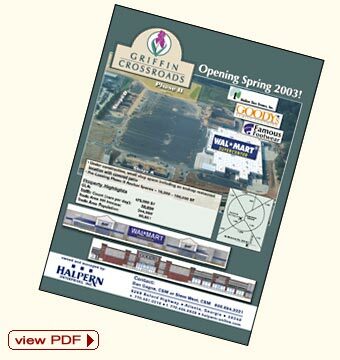 The four color ad features a shopping center siteplan, map, and information about the new project. This was an exciting project for us - short deadlines and quite a bit of artwork to design, including a detailed siteplan and shopping center logo. The Oxalosis & Hyperoxaluria Foundation Annual Report - A Bridge to the Future - provides the membership with an overview of the organization's accomplishments in 2001. The four color process, four page report offers an in-depth review of patient services and professional development programs. The annual report design is closely coordinated with OHF's new website: ohf.org to enhance consistency of their message to patients, families, and professionals. 4 Color Ad for "Shopping Center Business"
Stone Ridge Capital provides Real Estate Advisory Services to institutional investors. For SRC's latest project, the marketing and presentation of 14 JDN Realty Group Retail Centers, Relevant Arts provided design services including a 4 color full page ad for "Shopping Center Business". The ad has strong ties to the marketing brochure used as a direct mail piece. SRC's new website launched to provide online-marketing of the JDN properties, featuring a slideshow interface on the homepage. Each of the properties are synopsized with a photo and a list of basic information. Interested investors are able to email SRC to inquire further about each of the properties. Relevant Arts worked closely with long time friend and client Andy Klubock to design a new identity for his latest venture - Summits Wayside Tavern. The logo represents Klubock's first three restaurant locations and the ongoing pursuit of success in this teamwork based environment. Relevant Arts has developed a full identity package, including stationery system, customer id cards, menu cover, exterior signage, and other collateral pieces. Summits marketing efforts include their new website.